If your KitchenAid dishwasher is displaying an error code, the fault code explanations below will assist you to diagnose what is wrong. 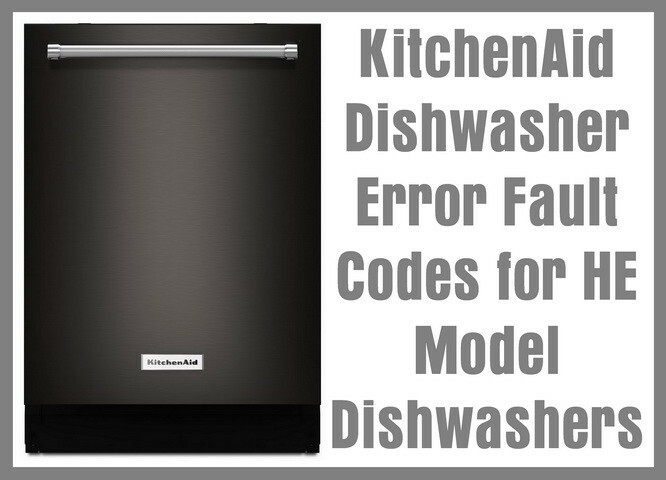 Knowing exactly what an error code means can help you to fix your KitchenAid dishwasher yourself. Error codes help you to troubleshoot your dishwasher and to find out which part most likely needs to be replaced. KitchenAid HE model dishwashers signal or alert you of an error code by flashing the clean light in a certain pattern that identifies the dishwasher error. The light will first flash the function code, then it will pause for 2 seconds and then flash the problem code. As an example, 8 flashes followed by 2 flashes (8-2) means “Drain pump electrical problem” issue. A 5 second pause will occur and then the light will repeat the error pattern. The control panel and buttons are disabled when an error code flashes. Error Condition: Electronic control board detects stuck relay on the circuit board. Repair or Check: Remove power to the dishwasher for 5 minutes to try and reset. If the code comes back when you restore the power, check the wiring and components. If wiring and components are okay then replace the electronic control board. Parts Needed: Electronic Control Board. Error Condition: Damaged or bad memory on the control board. Repair or Check: Remove power to the dishwasher for 5 minutes to try and reset. If the code comes back when you restore the power, replace the electronic control board. Error Condition: The electronic control board has detected stuck key on the control panel. Repair or Check: If none of the keys work or the control panel has damage, replace the electronic control panel. If the control panel is working, the problem may be the electronic control board. Error Condition: The electronic control board detected no communication from the control panel. Error Condition: There may be a break in the wiring or the thermistor/OWI failed. Repair or Check: Shut off power and check the wiring to the thermistor/OWI circuit. If the circuit wires are not damaged then replace the thermistor/OWI component. Error Condition: The thermistor/OWI circuit has shorted out electrically. Error Condition: OWI (Optical Water Indicator) failure. Repair or Check: Shut off power and clean the OWI and if the error code comes back when you restore power then replace the OWI. Error Condition: The electronic control board detects no circulation in the pump motor operation. Repair or Check: Shut off power and check all wiring connections in the motor circuit. Re-secure any loose wires. Replace the wiring harness if it is damaged. If the wiring connections are connected not damaged and secure then replace the pump motor. Error Condition: Door won’t shut or latch. Repair or Check: Depress the start button and close the door. If the error code keeps showing up then shut off power to the dishwasher and check the door latch mechanism. Check the wires attached to the door switch. If the latch and the wiring are in working order, replace the door switch. Error Condition: Dishwasher door will not open. Repair or Check: Check the wires on the door switch. If the wiring is secure and not damaged then replace the door switch. Error Condition: The electronic control board does not detect water coming into the dishwasher tub. Repair or Check: Shut off the power and water to the dishwasher. Check the water supply from the wall for proper flow. Check wiring to the water inlet valve solenoid. If the wiring and water supply are okay then replace the water inlet valve. Error Condition: Water inlet valve has electrical issue. Repair or Check: Shut off the power and water to the dishwasher. Check the water supply from the wall for proper flow. Check wiring to the water inlet valve solenoid. If the wiring and water supply are okay then replace the water inlet valve. If the problem keeps happening then replace the electronic control board. Error Condition: Soap suds or air is in the water pump. Repair or Check: Check the water fill level. Check for extra suds in the fill water in the bottom of the dishwasher tub. If the water fill level is low then replace the water inlet valve. If there is to much sudsing then check the detergent dispenser and replace if damaged. Error Condition: The float switch is open position. Repair or Check: Check the overfill float switch to see if has become stuck. Make sure the inlet water fill valve is shutting off the water supply when the dishwasher is turned off. Error Condition: Incoming water is not hot. Repair or Check: Use a thermometer to check the water temperature to be sure it is hot enough. If not 110 degrees F or higher then check your water heater. If the water temperature is normal as in 110 to 120 degrees F then replace the thermistor/OWI or the electronic control board. Error Condition: Heating element does not heat. Repair or Check: Shut off power and check the heating element. Replace it if it is damaged. If element not damaged then check the wiring to the heating element. If the wiring is connected and okay then replace the heating element. Error Condition: Heating element will not turn off – Constant heating. Repair or Check: Shut off power to the dishwasher for 5 minutes and if the error code comes back when you turn power back on then replace the electronic control board. Error Condition: Slow water drain from dishwasher tub. Repair or Check: Shut off power to the dishwasher and turn off water. Check the drain for blockage. If the drain is clear then check the wiring on the drain pump. If the wiring is okay than replace the drain pump. Error Condition: Drain pump has an electrical problem. Repair or Check: Shut off the power to the dishwasher and shut off water. Check wiring on the drain pump. If the wiring is okay then replace the drain pump. Error Condition: Electronic control board is not able to detect the position of the diverter. Repair or Check: Turn off power to the dishwasher and check the wiring going to the diverter motor. If the wiring is okay then replace the diverter. Error Condition: Diverter is stuck in on position. Repair or Check: Remove the lower dishrack and the lower spray arm. Disassemble the sump and then check the diverter disk and replace if it is damaged. Error Condition: The diverter disk is missing or has come loose. Repair or Check: Remove the lower dishrack and the lower spray arm. Disassemble the sump and then check to see if the diverter disk is missing or loose. If the disk is missing then install a new disk. Error Condition: Lower spray arm error – Not moving. Repair or Check: Check for anything blocking the lower spray arm causing it to not turn. Shut off power to the dishwasher and check the wiring connections on the lower spray arm motor. If the wiring is intact then replace the lower spray arm motor. Error Condition: Electrical dispenser problem. Repair or Check: Shut off power to the dishwasher and remove the outer door panel. Check the wiring in the detergent dispenser circuit and if the wiring is intact then replace the detergent dispenser. Error Condition: Vent wax motor electrical problem. Repair or Check: Shut off power to the dishwasher and check the wiring in the vent wax motor circuit. If the wiring is intact then replace the vent wax motor. Error Condition: Drying fan issue. Repair or Check: Shut off power to the dishwasher and check the wiring in the drying fan circuit. If the wiring is intact replace the drying fan. 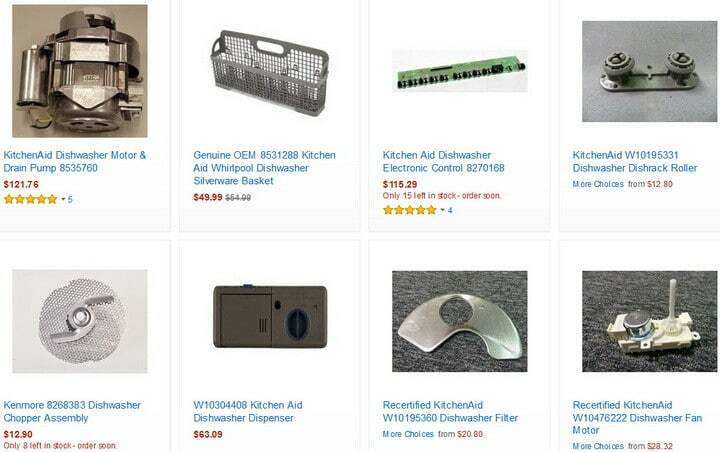 here are many new OEM parts that will fix your dishwasher at a low price. If you have questions about an error or fault code on your KitchenAid dishwasher, please leave a comment below and we will be happy to assist you to troubleshoot and fix your KitchenAid dishwasher. 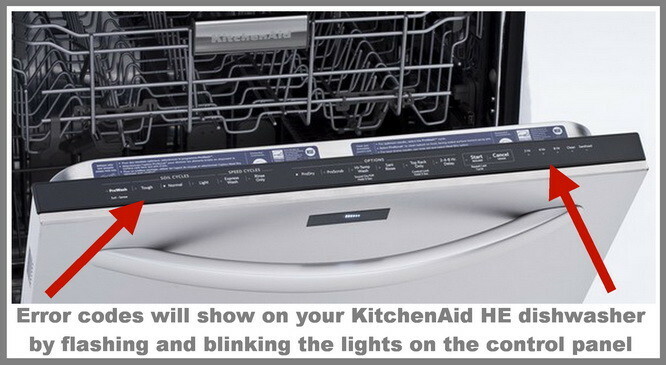 Error code shows — add dish light is on and rinse cycle light. U it will not respond to any touch buttons. Remover power for 10 minutes with no change to lights when power returned. Kitchenaid Dishwasher was in the middle of the cycle and the power went off due to Hurricane Irma moving through Atlanta, Georgia area. Power was off for 20 hours. Once power came back on the START/RESUME button was blinking and the DRYING light were blinking continually with no pauses. Tried turning off breaker for a minute and no change, tried for 5 minutes and no change. Pressed HEATED DRY, NORMAL, HEATED DRY, NORMAL within 6 seconds like one website recommended and no change. Pressed HI-TEMP SCRUB and HEAT DRY in multiple variations like another site recommended and no change. Not sure how to get panel off to check fuse. Any recommendations at this point would be appreciated before I call a repairman.